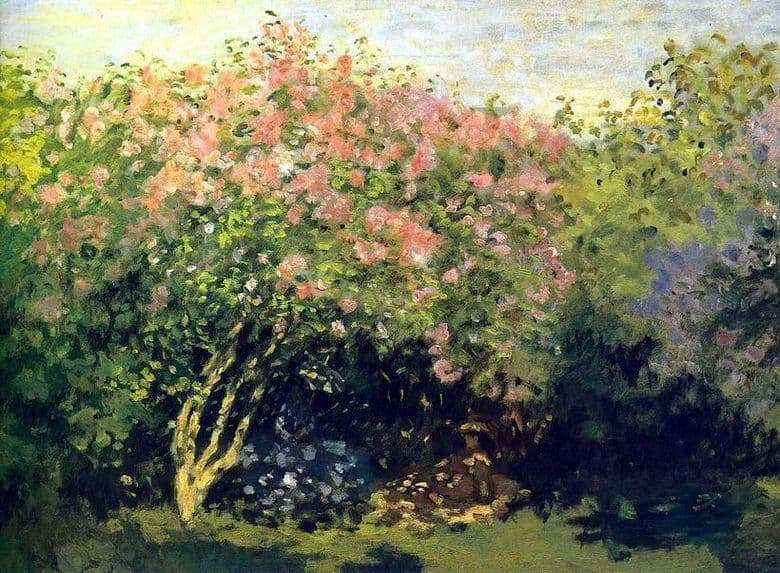 “Lilac in the sun” (by Claude Monet) was written during the heyday of impressionism. It contains all the features that are characteristic of this style in this era – the paint falls bright spots, the presence of a broad brushstroke is obligatory, but the author pays special attention to the balance of shadow and light. The artist tried to show us not just a branch of lilac, he tries to give us his impression, which she made to him. At first glance, there is no one in the picture except a lilac bush, but if we take a closer look, we will notice women who hide from the scorching sun in the shade of lilac that blooms. It seems that the siren bush is trying to hide the women hiding under it from the scorching sun. Their silhouettes merge with the landscape, so we can not immediately find them. One of the women represented was the author’s wife, Camilla. The artist wanted to show us the main visual impression: the blinding eye of the sun, the play of colors – from the tender green foliage to purple and pink flowers. A fleeting scene from everyday life, which Monet grabbed, separates the viewer from the picture with a little hazy mist. This is the haze and tries to emotionally engage us in what is happening in the picture. This is all Monet. Work on the picture, the author began in the garden of his house near Paris in 1872. The first impressionist painting, which was brought to Russia in 1899 by Russian collector Sergei Shchukin (purchased it from Durant-Ruel, Paris). Osip Mandelstam described his impressions of the picture in his work “Impressionism”.